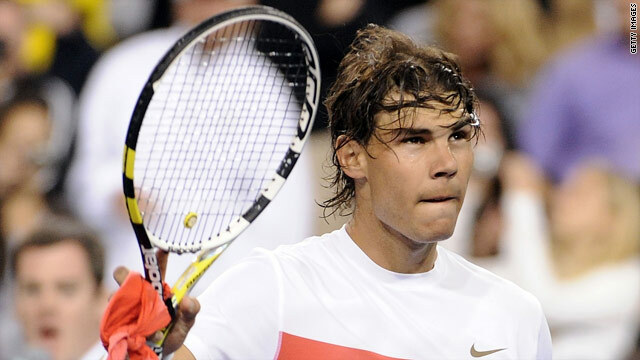 Rafael Nadal is seeking to win the season's opening Masters tournament for the third time. (CNN) -- Rafael Nadal made a successful return from injury to begin the defense of his Indian Wells Masters title with a 6-4 6-4 win over Germany's Rainer Schuettler in California on Saturday. The world No. 3, playing his first match since retiring during his quarterfinal against Andy Murray at the Australian Open in January, moved into the third round after being handed an opening bye. The Spaniard will next play Croatia's Mario Ancic, who came from behind to defeat Frenchman Julian Benneteau 4-6 7-6 (7-5) 6-3. Nadal, who has won the ATP Tour tournament twice, romped to a 4-0 lead in the first set against former top-10 player Schuettler. "I started the match playing well," Nadal told the event's official Web site. "Later, when I played in favor of the wind, it was very difficult for me with the backhand because I felt it if I only touch the ball, the ball was out, went too much. But it was a good start, with the conditions. I'm very happy." World No. 2 Novak Djokovic, who lost to Nadal in the 2007 final, overcame an embarrassing second set in his clash with Mardy Fish to repeat his victory over the American in winning the 2008 title. The Serbian, who guided his country into the quarterfinals of the Davis Cup last weekend following his triumph at the Dubai Tennis Championships, was "bageled" for the first time since 2008 before bouncing back to win 6-1 0-6 6-3. "I definitely had a couple of tiring weeks behind me with Davis Cup and Dubai, so I was really skeptical if I'm going to be able to physically recover from all of that, including the jet lag and time-zone change," said Djokovic, who next plays Germany's Philipp Kohlschreiber. "I was happy with the way I moved today. I had a lot of ups and downs. Overall, first and third set were quite okay, so hopefully I can get some good nights' sleep and get ready for the next one." Fifth seed Nikolay Davydenko cruised into the third round with a 6-4 6-4 win against Latvia's Ernests Gulbis, and the Russian will next play Serbian 29th seed Viktor Troicki. Eighth seed Marin Cilic crashed out, with the Croatian upset by Spain's Guillermo Garcia-Lopez, who won 7-6 (7-1) 6-0 to earn a third-round clash with Thomaz Bellucci. The Brazilian 26th seed had a walkover against former world No. 1 Juan Carlos Moya. Spanish 10th seed Fernando Verdasco also progressed, beating Paraguay's Ramon Delgado 6-4 6-1 to set up a clash with Tomas Berdych. The Czech 19th seed defeated Florent Serra of France 7-5 4-6 6-4 on Saturday. World No. 1 Roger Federer begins his campaign on Sunday against Romania's Victor Hanescu, having missed the Dubai event and the Davis Cup tie defeat by Spain due to ill health. The Swiss star has not played since winning his 16th Grand Slam title at the Australian Open because of a lung infection.